The post Researchers 3D Print New Skull for Dog with Cancer by Jackie Brown appeared first on Dogster. Copying over entire articles infringes on copyright laws. You may not be aware of it, but all of these articles were assigned, contracted and paid for, so they aren’t considered public domain. However, we appreciate that you like the article and would love it if you continued sharing just the first paragraph of an article, then linking out to the rest of the piece on Dogster.com. 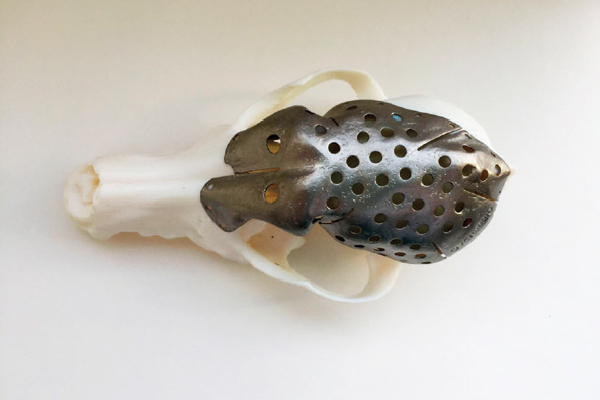 A 9-year-old Dachshund named Patches with a large multilobular osteochondrosarcoma tumor growing into her skull was recently saved thanks to a custom 3D-printed skull plate that was used to replace about 70 percent of the dog’s cancer-ridden skull. 3D print of a dog skull. Photography courtesy University of Guelph. In a joint effort, researchers and veterinary surgeons at University of Guelph’s Ontario Veterinary College and Cornell University’s College of Veterinary Medicine created the replacement skull, then removed the diseased portion of the dog’s skull and replaced it with the 3D-printed plate. Patches came through the surgery with flying colors. Thumbnail: Photography courtesy University of Guelph.